It’s Halloween, the witching hour. You’ve worked well into the night, and as you open the front door to your house you notice that it is unusually dark and foreboding. You creak across the floor to your kitchen, listening to your shutters rattle against the wind, and as you flick on the lights you’re shocked to find – a tastefully decorated buttercream cobweb cupcake. We’ll admit that cupcakes aren’t the spookiest part of Halloween, but some of the confections created by our favorite sugar-slinging bloggers taste so darn good that it’s scary. 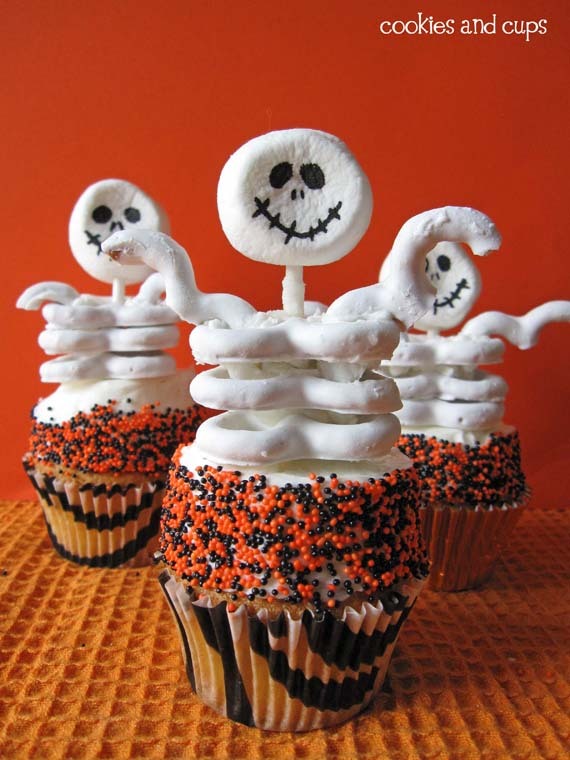 For example, here are 18 cute and creepy Halloween cupcake recipes that you need to try this season. These miniature cupcakes are easy to make and almost too cute to eat, which is a shame because they’re bound to be devoured within minutes at your Halloween party. 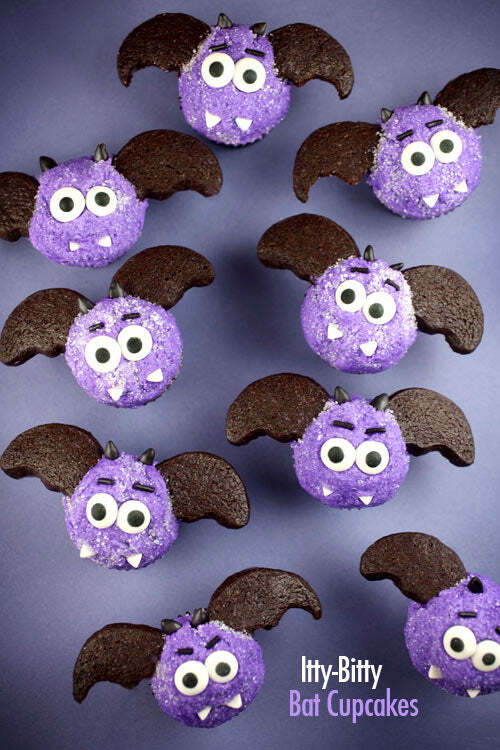 All you need to create your own batch of tiny purple bats is a miniature cupcake pan, a half-moon cutter for the wings and a selection of sprinkles that you can find at any local grocery store. Check out the recipe over at Bakerella. #2. Halloween Candy Lava Cakes. What do you do with all of that excess Halloween candy you’ve got laying around? 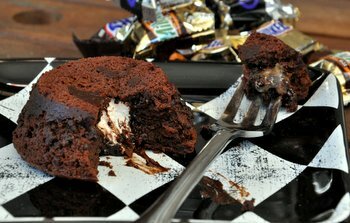 If you’re smart, you’ll follow Nicole Weston’s example and bake them into some killer chocolate lava cakes. Sweet and gooey, they’re the perfect thing to help you get over those post-holiday blues. Check out the full recipe over at Baking Bites. #3. Friday the 13th Slasher S’Mores Cupcakes. 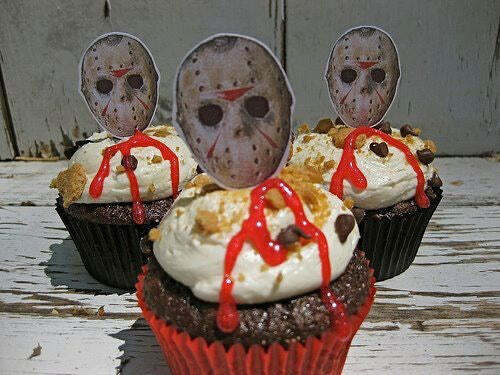 Pay tribute to America’s favorite summer camp serial killer this Halloween by whipping up a batch of Jason Voorhees-inspired Slasher S’Mores cupcakes. These chocolate cupcakes feature delicious marshmallow icing topped with graham crackers, chocolate chips and some food coloring blood swirls. You can complete the look by sticking in some free printable Jason cupcake toppers. The recipe and the link to the toppers printout can both be found over at Bake and Destroy. #4. Halloween Spider Web Cupcakes. There are a dozen recipes for spider web cupcakes online, but none of them look as good as the ones designed by Jessica and Mandy of Little Birdie Secrets. The trick is to use black decorating gel to swirl the spider web design onto the cream cheese frosting. Then you top it all off with a plastic spider ring and some glitter and voila, you’ve got a treat that looks as good as it tastes. Get the full recipe from Little Birdie Secrets. #5. Mini Halloween Monster Cupcakes. 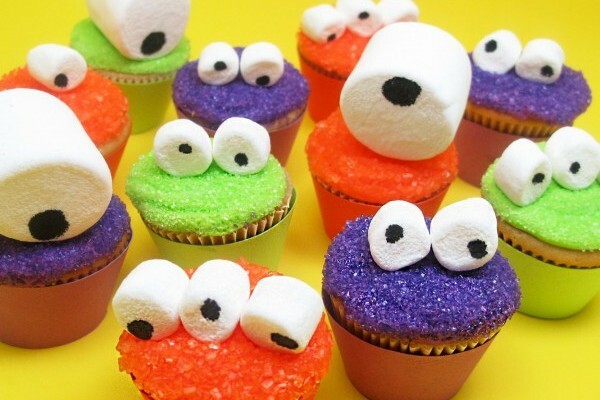 You don’t have to be a baking genius to whip up this batch of colorful monster mini-cupcakes. All you need is a miniature cupcake pan, an edible marker, a few marshmallows and lots and lots of colored sprinkles. This super-simple recipe is easy to follow and is a perfect activity to do with your younger children. Let them go crazy with the marshmallow eyes and see what kind of monsters they can come up with. You can find the recipe over at Celebrations.com. (Just like a mummy, get it? No? Oh well, we tried). Snag the recipe at Love and Olive Oil. #7. Frightfully Fun Frankenstein Cupcakes. Make a statement with these fun and festive Frankenstein cupcakes. With taught, emotionless mouths and really unsettling chocolate eyes, they’re sure to be a hit at your next Halloween party. Unless everyone attending said party is a squeamish young child, in which case you’d be better off with the marshmallow monsters. Either way, these things taste great. Go grab a monster-head baking pan and follow the recipe at SquawkFox. #8. 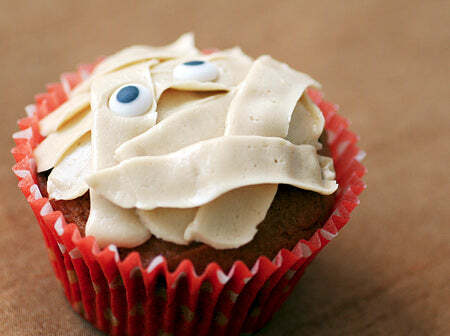 Scarily Healthy Gluten-Free Halloween Cupcakes. The creepiest thing about these gluten-free cupcakes isn’t the green matcha icing – it’s the fact that the recipe uses chickpeas in place of flour. You’ve got to try it before you knock it, though, because one bite of these healthier-than-your-average-cupcakes will blow you away. Head over to Creative Plume for the full recipe. #9. Brain Cupcakes with Raspberry Filling. You and the horde of zombies descending upon your Halloween party can now share the same taste in desserts thanks to these uber-gory zombie brain cupcakes. They’re pink, smooshy and loaded with a raspberry jam filling that’s as delicious as it its off-putting. Head over to She Bakes Here to get your gross on. #10. 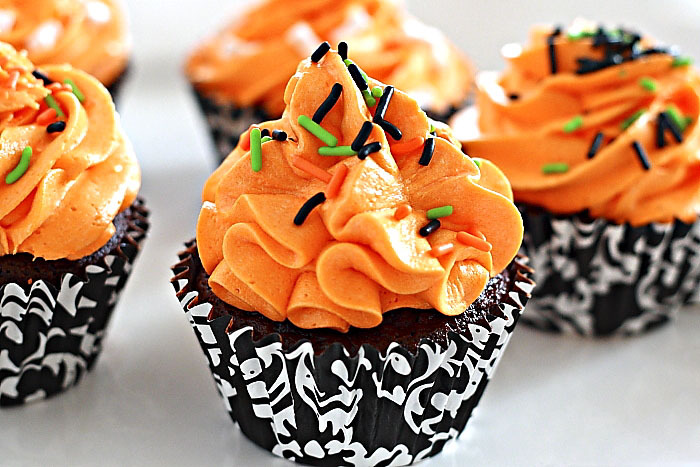 Chocolate Butterscotch Halloween Cupcakes. As far as Halloween cupcakes go, these chocolate and butterscotch creations are a classic. They’re not gimmicky, just darn good – the secret is using honey to sweeten the batter. Of course, you’ll need some orange food coloring, black sprinkles and some themed cupcake wrappers to really get into the spirit. Add the recipe to your Big Baking Book over at the Lemon Drop blog. Dropping some candy dots on top of white frosting and calling it a “ghost cupcake” is a cop out. 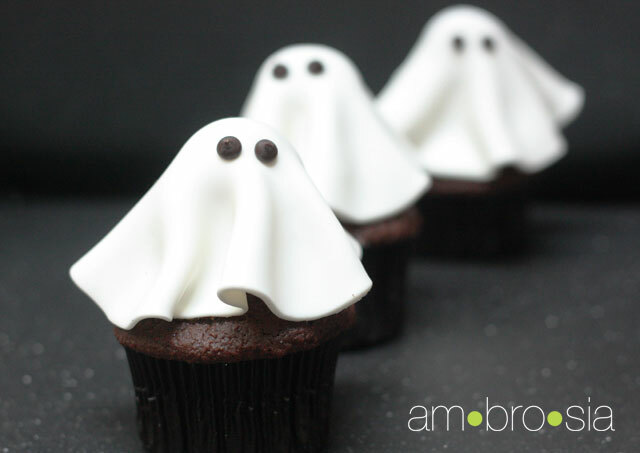 If you really want to make spooky ghost cupcakes, you’ll make them of the 3D, sheet-billowing-in-the-wind variety. While the design looks fancy, it’s the “easiest cupcake decoration ever,” according to the recipe. You simply roll out some fondant, drape it over a tootsie pop and stick on some chocolate chip eyes and you’ve got a cupcake that’s bound to impress at the office. Grab the recipe with a helpful picture tutorial over at Ambrosia. #12. Fun and Easy Chocolate Pumpkin Cupcakes. Is there any design more fitting for Halloween than the Jack-O’-Lantern? Probably not. 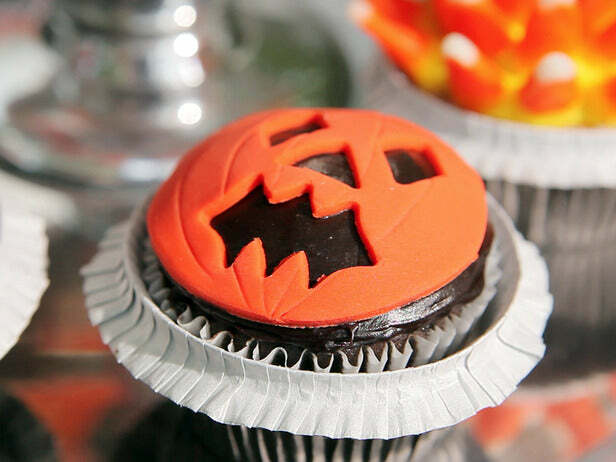 If you’re in a bind and need a killer set of Halloween-themed baked goods to bring to your local PTA meeting, you can whip up your own batch of Jack-O’-Lantern cupcakes by covering some store-bought cupcakes with chocolate icing and prepared orange fondant. It’s the ultimate easy recipe for the ultimate lazy baker. Check out a step-by-step guide at the frugal living blog Brown Beauty Babe. #13. Bloody Chocolate Rat Cupcakes. Rats and cupcakes are two things that should never be together in the same room – unless, of course, the rats are made out of chocolate covered strawberries and you’re using them to top off your gross-but-good Halloween cupcakes. 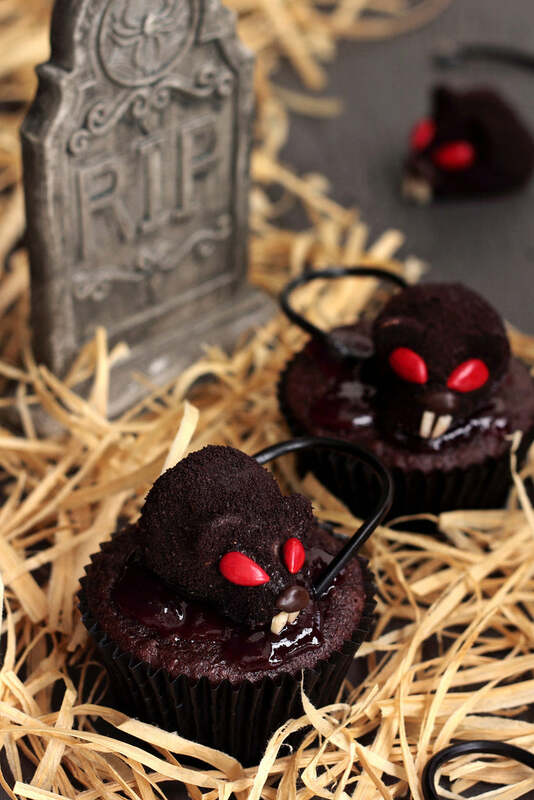 In that case, we love rats – and once you try this awesome recipe for bloody chocolate rat cupcakes, you will too. Check it out over at 6 Bittersweets. Who says witches have to be all cackles and cauldrons? 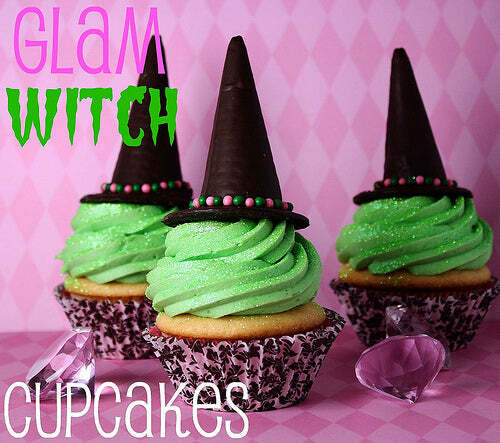 These glam witch cupcakes offer a glitzy take on the classic “witch hat” cupcake design that would win over even Glenda the Good Witch – and you know she’s hardly a witch at all. With sparkly green icing and a beaded decorative wafer hat, they’re sure to be a hit at any princess’ party that you’re stuck catering this season. Check out the recipe (and the great accompanying blog post) at Confessions of a Cookbook Queen. No rundown of Halloween cupcake recipes would be complete without at least one blueprint for skeleton cupcakes. These particular skeleton cupcakes feature a sculptural set of bones rising out of a black and orange cupcake “grave.” Baking a dozen of them is an involved project – for the skeleton alone you’ll need marshmallows, Popsicle sticks, white chocolate pretzels and a lot of patience – but the finished product looks great and tastes even better than it looks. Start constructing your own today by checking out the recipe from Cookies and Cups. 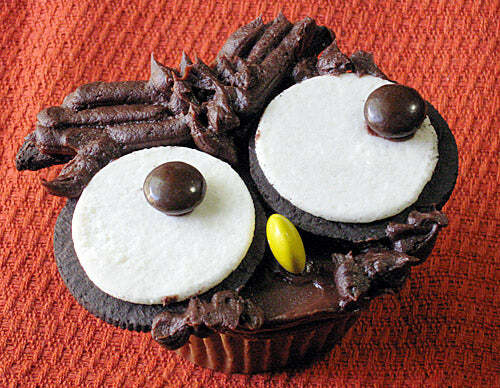 Okay so owls might not be the be the spookiest animal associated with Halloween, falling somewhere between werewolves and that stray cat-that-you-thought-sounded-like-a-werewolf-in-the-dark on the spooky scale, but that shouldn’t stop you from baking a few dozen of these awesome owl cupcakes. 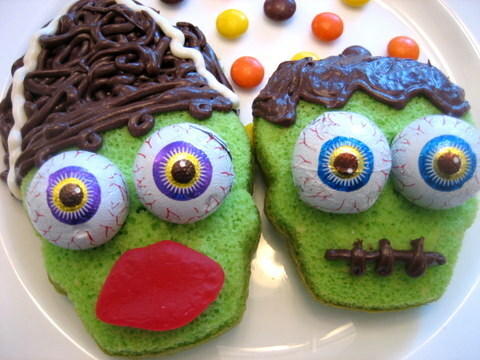 With big cartoony eyes and a near-lethal amount of chocolate icing, they’re will over even the most die-hard horror fans. Get the recipe from Ezra Poundcake. #17. 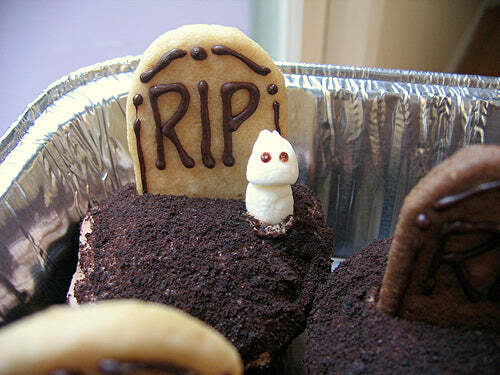 Tombstone Devils Food Cupcakes. There are about a hundred different recipes for them, all of which are pretty easy to make. This one in particular is our favorite, mainly because it uses shortbread tombs – which we love – and devil’s food cake with a cream cheese filling. So it’s sort of like you’re eating the soul of the ghost that inhabits that particular grave, which strikes us as super cool. Grab the recipe over at Alpine Berry. The witch may be dead, but that shouldn’t stop you from feasting on her legs – at least it shouldn’t if those legs happen to be made out of Red Vines and candied almonds. This super-creative take on the classic witch cupcake uses dangling legs and an overturned cake to make it seem like the wicked witch of Oz lore was squished by a wayward pastry. It’s fun, clever, and super easy to make. Find step-by-step instructions for the recipe at Sweet Simple Stuff. Got a Great Recipe? Let Us Know! 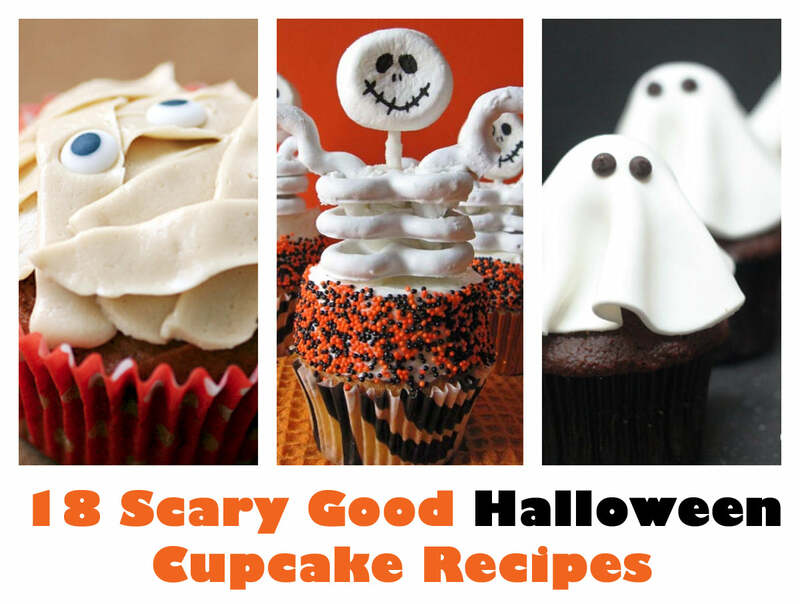 If you’ve got a great recipe for spooky Halloween cupcakes or if you’d like to share one of your favorite recipes from the cooking blogs that you follow, let us know in the comments. We’d love to see what you come up with and if it’s really cool, we’ll share it with all of our readers on the CandyStore.com Blog.